For those unfamiliar, a worker placement game is one that utilizes a "mechanic requires players to draft individual actions from a set that is available to all players. Drafting is done one-at-a-time and in turn order. Once drafted, an action can no longer be taken until a subsequent turn or until the action space is no longer occupied by a worker" (according to BGG's definition). Thus, any game on this list will use this worker placement mechanism and usually will use other mechanisms along with it. I recorded a video of this top ten list for your enjoyment. Agricola is a medieval farming themed game for one to five players, designed by Uwe Rosenberg, published by Z-Man Games, and playable in about thirty minutes per player. I think Agricola is the pinnacle of worker placement games. It has a wonderful tension of never feeling like you have enough workers to do everything you want to do, plus there's the added tension of blocking other players out of key spots. The Minor Improvements and Occupations add enough player power variety to make each game feel different - and if those decks ever get old, there are eight or so additional ones in existence. I include Agricola: All Creatures Great and Small here as a shorter two player version of Agricola because it very much captures the same feel in a two player only version of the game. 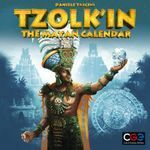 Tzolk'in: The Mayan Calendar is a Mayan themed game for two to four players, designed by Simone Luciani and Daniele Tascini, published by Rio Grande Games, and playable in about an hour and a half. Tzolk'in's well-known gear "gimmick" (in which gears take up most of the board) is more than just a gimmick, as it creates a lot of challenging decisions about where to place your workers and whether or not the moment is ripe to pull them off the gears. I was concerned whether this game would hold up to extensive play, but the variable chits for starting powers and the large number of avenues you can take for success in this game have given it very long legs, indeed. I did an in-depth video review of Tzolk'in a while back, as well as a written review. Belfort is a light fantasy themed game for two to five players, designed by Jay Cormier and Sen-Foong Lim, published by Tasty Minstrel Games, and playable in about two hours. Belfort works as a great mix of worker placement and area control game, because a large part of what you do to earn points is to control regions and locations on the board. The variety of guilds helps this game from becoming too static as well. Le Havre is a merchant-themed game for one to five players, designed by Uwe Rosenberg, published by Lookout Games, and playable in about thirty minutes per player. For me, Le Havre is something of an "economic engine" game, as you have to really build up your resources throughout the game to earn those big victory point cards at the end of the game. The function of buildings as both an investment in victory points and as a potential revenue stream is perhaps my favorite facet, as key early buildings can both earn you vital resources and contribute to your end-game point total. The largely random order of said buildings gives the game significant variety from play to play. Copycat is a politically themed game for two to four players, designed by Friedemann Friese, published by Rio Grande Games, and playable in about an hour and a half. Given that this game blatantly "borrows" mechanisms from Agricola, Dominion, and Through the Ages, I expected this game to feel like a gimmick, but it actually comes together quite well. The mix of the Through the Ages row order, the Dominion method of deckbuilding, and Agricola-style placement of workers ends up creating difficult decisions throughout, and the semi-random ordering of the cards and the locations adds to the uncertainty and tension. I did an in-depth video review of Copycat a while back, as well as a written review. Ora et Labora is a monastery building game for one to five players, designed by Uwe Rosenberg, published by Z-Man Games, and playable in about thirty minutes per player. This game feels reasonably similar to Le Havre (mentioned earlier on this list) to me, but stands apart thanks to the use of a rondel for distributing the resources in the game. I have not played Ora et Labora as extensively as the higher choices on this list, but I've deeply enjoyed each play of it so far. The Manhattan Project is a scientist-themed game for two to five players, designed by Brandon Tibbetts, published by Minion Games, and playable in half an hour to an hour and a half depending on player count. The Manhattan Project is a winner for me because of the fun theme and the surprisingly quick play for two players, along with the fact that it almost feels like a different game with five players versus two. Lords of Waterdeep is a lightly-themed game set in the "Forgotten Realms" universe for two to five players, designed by Peter Lee and Rodney Thompson, published by Wizards of the Coast, and playable in about an hour. This is my standard "introduction to worker placement" choice as it does a brilliant job of introducing the mechanism of worker placement to new players. I find the base game to be a bit dull for me as a frequent game player, but the expansion Scoundrels of Skullport has breathed new life into this game for me. I did an in-depth video review of Lords of Waterdeep a while back, along with a written review. 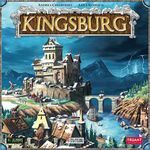 Kingsburg is a medieval themed game for two to five players, designed by Andrea Chiarvesio and Luca Iennaco, published by Fantasy Flight Games, and playable in about an hour. This mixes worker placement with a "technology tree" of sorts that each player must develop on their own using the proceeds of the worker placement choices. The use of dice as workers and how the roll of the dice influences where you can place (along with blocking) is a key part of the joy of Kingsburg. 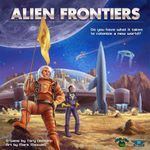 Alien Frontiers is a space exploration game for two to four players, designed by Tory Niemann, published by Clever Mojo Games, and playable in about an hour. For me, Alien Frontiers is the most brutal of the worker placement games I play frequently, as the number of available spots is relatively low and some of the options allow you to do devastating things to other players. I generally play this only with my more cut-throat friends, but when I do so, I always find it a deeply enjoyable experience.